This Saf-T-Liner MVP model was only bought in 1996. The only rear engine MVP bus. These rear engine buses can carry 84 passengers. 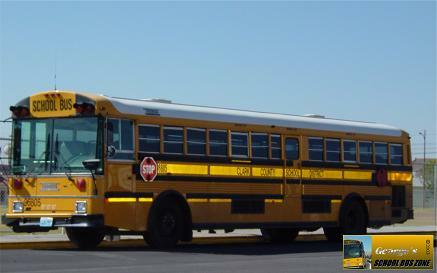 This was the first year CCSD bought rear engine buses. "Back in the early 90's we created a Saf-T-Liner with a lighter gross weight and lower price point. We thought up a catchy suffix to help market it; MVP. Maneuverability, Visibility & Protection." Comment: Notice the stop arm signs? The last year they bought that type of sign. You can also see the reflective devices on the bus in the bottom picture (I left the flash on by accident). 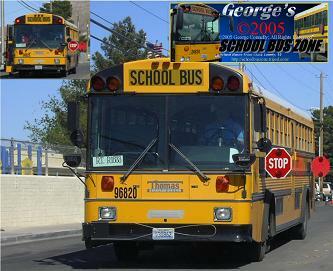 This bus is the last year CCSD had 2 emergency exit windows on each side (left & right sides) of their buses. Like the 1995 Saf-T-Liner MVP EF, it has a grey interior; this was also the last one to have that. This bus needs a washing. Last thing, the number on the front of the bus (seen in the bottom picture) is different on this bus than the other ones like it that year. The number is supposed to be on the panel under the right turn signal in lettering type similar to the numbers on the sides. I'm wondering what happened? I've seen this on a few buses like a 1992 Blue Bird All-American FE (on the rear of the bus, but it was in the right location), one side of the bus has different lettering type on the number. Comment: Did you notice the duct tape on the front vents? Here are two photos in one. The first smaller one in the corner is stopped to drop off students. The main photo is it leaving. The crossing control arm was replaced, these figure 8 arms were put on starting with the 1997 buses. This was a replacement obviously; it used to have the plastic yellow crossing control arm. Comment: I did ride this bus once when it was brand new because my regular driver wasn't able to pick us up, so the driver next to our space picked us up after he dropped his students off. The last year those types of stop arms were used, and it was also the last year they bought the MVP engine rear model from Thomas. It's amazing that I rode this same bus when I went to the school it is currently passing by in this picture.